Life Before the Dinosaurs: Terataspis. Terataspis grandis can be translated to "grand monster shield," because of its huge size and monstrous appearance. Although no complete skeleton of Terataspis has been found, many fragments of the exoskeleton have been found, so scientists have gradually been able to reconstruct Terataspis with every fragment they've found. 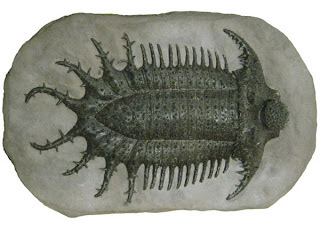 Terataspis was a strange genus of trilobite from the Devonian Period. Its body was completely covered in small barbs, possibly as a defense against huge predators such as Eusthenodon, Eusthenopteron, and Dunkleosteus. This scale shows the five largest species of trilobite, largest on the right, and smaller on the left. 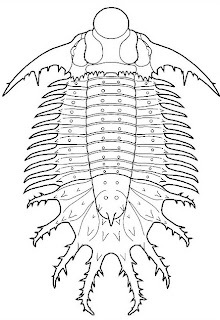 Terataspis grandis is the third biggest species of trilobite. Terataspis was found in New York State and Ontario, Canada. It lived in the Devonian Period. Scientists believe that Terataspis was a detritivore, meaning it ate edible particles of dead plants and animals. But Terataspis may have predated upon other animals if they were easy to catch. This model is based on the fragments of Terataspis so that scientists can try to learn more about it with a recreation. It can be hard to learn about a fossil if it's in pieces. Some of Terataspis's relatives are Selenopeltis and Odontopleura. Unlike its relatives, Terataspis had the bars sticking out of the abdomen with barbs on them. Terataspis was also much bigger than those relatives. What a cool trilobite! And I like that scale comparison pic with the umbrella-- it's oddly funny. I agree--that picture makes them look like Mary Poppins trilobites, or like they've just come in from the rain. Dinner guests. I've said it before but I'll say it again: Aaugh!